The Leader's Role in Change Management - Bellrock Benchmarking Inc.
A company’s leader plays three primary roles in change management. Over the coming months we will unpack each of these roles in a series of blog posts. This post tackles the #1 contributor to the success of any change initiative, according to Prosci’s nine benchmarking studies conducted over 20 years: leadership’s active and visible participation. In the coming months we will discuss the two further roles of leadership: building a coalition of sponsorship and communication. Holding a Town Hall kick-off meeting to deepen awareness (the why) of the business need for change. Initiating regularly scheduled, rarely missed, ideally face-to-face one-on-one meetings with key staff to build the desire for change (what’s in it for me). Participating in project meetings where the new systems are being developed. Publicly assigning resources (staff time and budget) to the initiative. Leading by example in use of the new systems. Positively reinforcing the effort as others try the new systems (even if the results aren’t there yet). Publicly and privately celebrating milestones along the way. This list is not comprehensive, but the leader that does all of these things is way ahead of the curve. As a leader, think back to the last change initiative your company underwent. Did you execute on any of the above activities, or engage in anything similar? 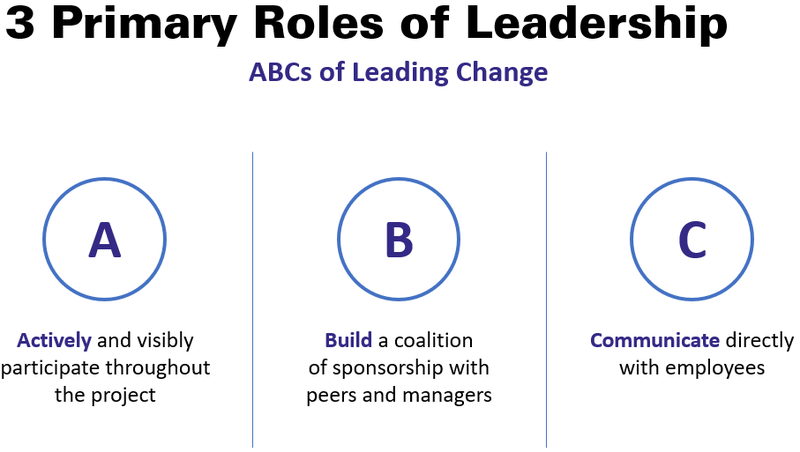 Often leaders are active and visible at the front end of a change initiative, but their participation peters out as the initiative progresses. Consistent active and visible participation will allow the change to take root and become habit in the organization. The simplest way to ensure you remain active throughout the change initiative is to schedule the activities (such as progress meetings and one-on-ones) and then stick to the schedule. Next time a change is brewing in your organization, what will you do the same and what will you do differently? Bellrock is a process benchmarking and change management company based in Vancouver, Canada. If your organization is embarking on a change initiative (and what organization isn’t changing these days) use these activities as a checklist. And if you found this article helpful, please share it with your networks.